Brian McFarlane is back with his old buddy Peter Puck. 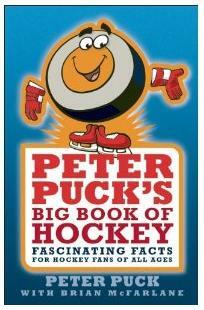 This time he's highlighting some of the most interesting facts in hockey in the new title Peter Puck's Big Book Of Hockey. Did you know that once four assists were awarded on one goal? Or that the first American city to celebrate a Stanley Cup championship was Seattle? Or that one old time player spent his summer's keeping in shape by wrestling bears? These are just a few of the many interesting facts and stories to be found within the 224 pages of Peter Puck's Big Book Of Hockey. All in all, it is fun read for fans of all ages. "Hockey’s most loveable expert has returned to the ice and to living rooms across the country! "Peter Puck has entertained fans of the game for more than forty years.After a lengthy hiatus from the spotlight, Peter has laced up his skates, jumped over the boards, and is back to share the game he so ardently loves with fans everywhere. "With fast-paced humour and fascinating facts, Love That Hockey Game introduces fans to the game all over again. From career-ending hits, lopsided score cards, stolen trophies, assaulted referees, and sabotaged ice surfaces, Love That Hockey Game will leave fans in disbelief and wondering if the stories could possibly be true—well, they are and that is what make’s Peter’s book such fun. 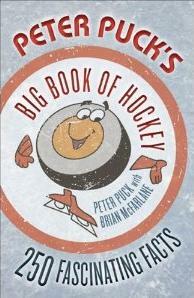 "Compiled by veteran sports writer and Peter Puck creator, Brian McFarlane, Love That Hockey Game is the perfect gift for fans of all ages. Produced in a charming format and accompanied with illustrations, Peter is ready to entertain."